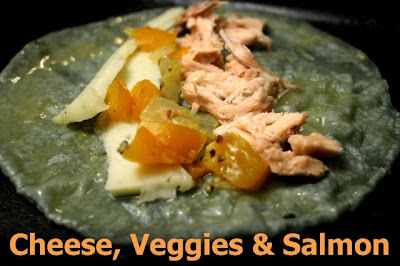 I just picked up blue corn tortillas at my local Latin market for 99 cents (three dozen), and created a colorful enchilada dish, using orange hued salmon from a can and green enchilada sauce. All my ingredients were cheap of course, but this dish is very rich in flavor. It's a little messy to make but tasty to eat. You can use metal tongs to dip and coat the tortillas, but they may tear them, so I just used my hands. I also used green enchilada sauce (although typical red sauce can be used). 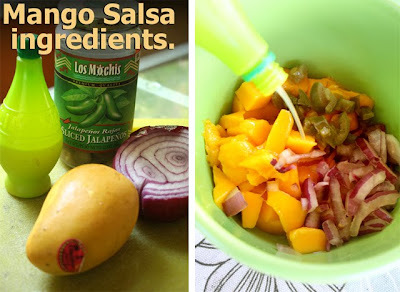 Green enchilada sauce is mild but more citrus/tart, and not as spicy as red. Normally tortillas are brittle and must be heated in oil to soften for stuffing then rolling up; but I have a lighter and easier method -- just loosely stack and microwave for 30 to 45 seconds until soft. So if you are looking for a flavorful (and lighter-than-normal) Mexican entree, try out The 99 Cent Chef's Salmon Enchilada. 15 oz. 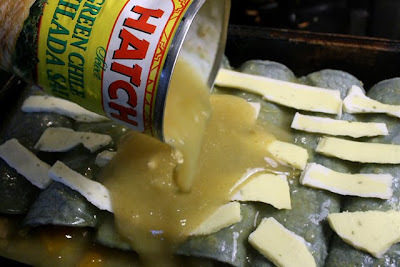 can of enchilada sauce - I used green, but you can substitute with easier-to-get red sauce. 7 1/2 ounce can of salmon - drained. 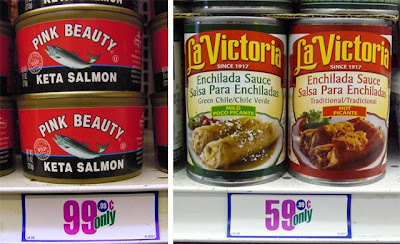 The can size (or soft pack) of salmon you use will determine how many enchiladas you can make. 7 slices of cheese - about 7 ounces. You can use any favorite, including American cheese. I used white Monterrey Jack that was on sale. 1/4 onion chopped - optional. 1/4 bell pepper chopped - optional. 1 tsp. of chopped garlic fresh or from jar - optional. 1 tsp. oil for sauteing onion and bell pepper. Saute chopped bell pepper, onion and garlic until soft, about 5 minutes. Drain can of salmon and loosely break it up in a bowl. Slice cheese into strips, or shred cheese if it is in block form. 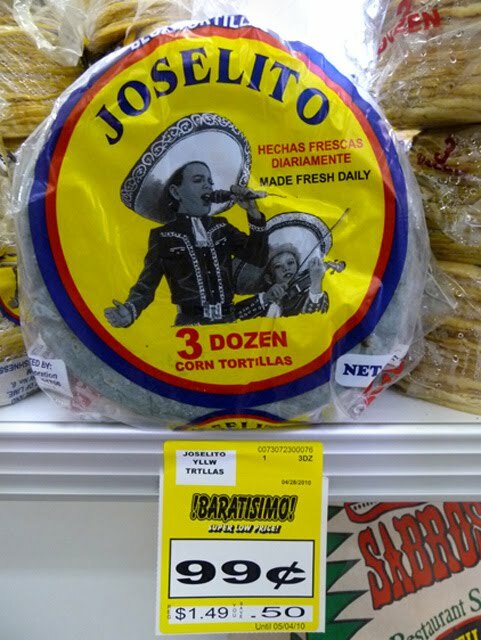 Microwave loosely stacked tortillas for 30-45 seconds until soft and pliable. On a large plate pour enough enchilada sauce to almost cover. Dredge tortilla in enchilada sauce on both sides. Place sauced tortilla into baking casserole dish and add enough cheese and salmon to cover middle of the tortilla. Add a teaspoon of sauteed veggies. Fold two sides of tortilla and place seam side down. Repeat this paragraph's steps for the other 5 tortillas. Once all the tortillas are stuffed and assembled in baking dish, add the rest of the cheese, any leftover sauteed veggies over the top and pour on the extra enchilada sauce. 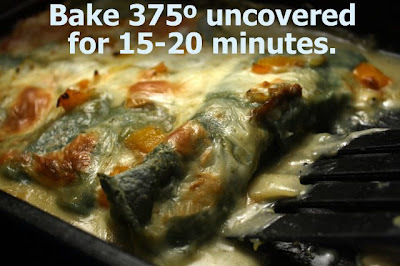 Bake in a preheated oven at 375 degrees about 15-20 minutes until the cheese is melted and the sauce is bubbling. When done, allow to cool for a minute then serve. If you are not a salmon lover, then substitute with cooked chicken from a can, fresh grilled or poached, and shredded. You can also use sauteed (and cooked through) ground turkey, or beef, mixed with a packet of taco seasoning. 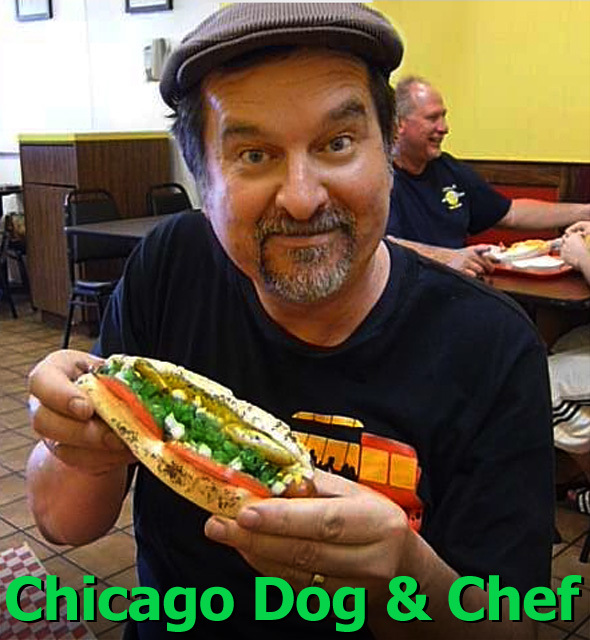 In less than a week The 99 Cent Chef serves up a scrumptious "August Hot Dog Month." And it will be a tasty selection of some of the best hot dog joints in L.A. In search of encased meat, this cuisinier treks from Fab Hot Dogs in the Valley (where the Chef has a comedic radioactive reaction to the Day-Glo relish on a Chicago Dog), to Earlez Grille on Crenshaw Blvd. in South L.A. for a Spicy Beef Link Dog with all the fixings, and to Carney's on the Sunset Strip for a zany and boozy Beer & Hot Dog Happy Hour -- all shot on video in Chefscope! You will have a ravenously good time the whole month long checking in for the latest video (3 done and more on the way), and I'll throw in a hot dog recipe or two along the way. Ever have a bacon-wrapped, grilled pepper-and-onion-topped L.A. Street Dog slathered in mayo, ketchup and mustard? The combination shouldn't work, but it does, and The 99 Cent Chef will take you step-by-step through the creation of a Los Angeles street corner culinary classic. So check back the first of August for a month of mouth-watering videos, photos and recipes. Pozole, like Menudo, is a rich chile flavored soup to soothe the system, taken the morning after indulging with too much cerveza or tequila. 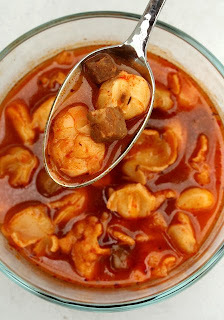 It's typically a stew made with cheaper cuts of pork -- like feet, ears, neck bones, etc. And it's a pre-Columbian recipe served during ancient Aztec temple ceremonies (thought to sometimes contain human sacrificed remains - thus, now made with similar-tasting pork). But had the official chef during an Aztec ceremony served the canned soup featured in this Deal of the Day the high priest might have ripped the cook's heart out and added it to the stew! Still, with the tweaks I suggest to Progresso below, this convenient version can make a decent meal. 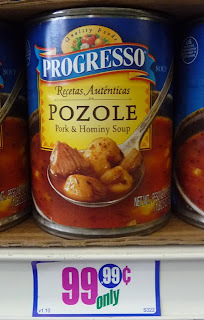 I'll confess, I tend to prefer Progresso's canned Italian tomato sauce -- I'm not so sure that their new Mexican soup line is off to a good start. First, looking at the label on the can, you get the impression the soup contains large chunks of tender pork. But the pieces I found were smaller than the hominy shown on the label - about a third of the size, really, just pencil eraser size, and almost as chewy. Larger and longer stewed pork chunks would have saved this canned soup. The hominy needed longer cooking as well, as it was too crumbly and not tender enough. However, the soup base is the best part. Progresso is on firm footing here. The tomato and chile have a subtle, spicy kick and a fragrant flavor of Mexican oregano and paprika herbs. So Progresso, with a couple of tweaks, you could have a worthy Deal of the Day here. 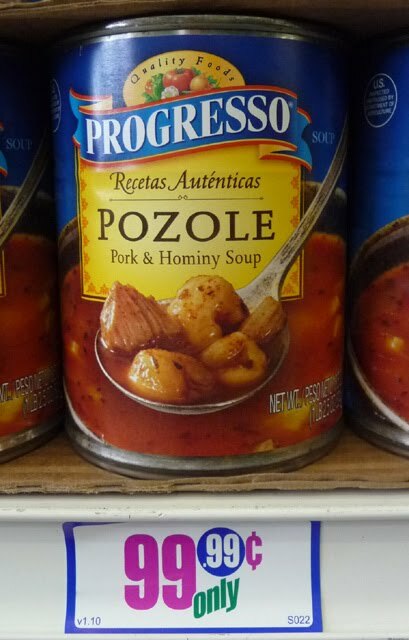 On a scale of 1-9, 9 being best, I give Progresso Pozole Pork & Hominy Soup a 4. With a taste of artichoke, heart of palm gives extra crunchy texture to a salad. 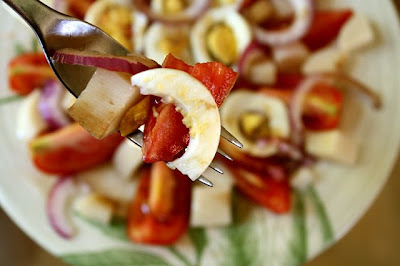 My recipe is adapted from a Brazilian salad -- Brazil is a major exporter of hearts of palm. I've seen a few different types of this salad at our local Brazilian restaurants, and each is quite different. Sometimes romaine lettuce is used along with black olives, carrots, tomato, corn and feta cheese, but they all share hearts of palm. The one I'm making is simple and filling - for a salad. 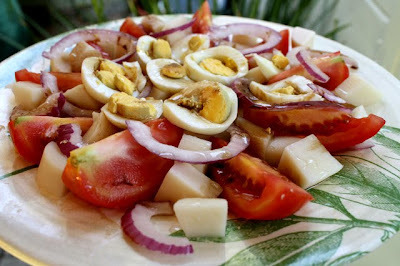 I chop a few tomatoes, some red onion, a couple of boiled eggs, and finally mix in a drained can of hearts of palm. The dressing is made with a tasty oil, and a couple splashes of tart/sweet balsamic vinegar. 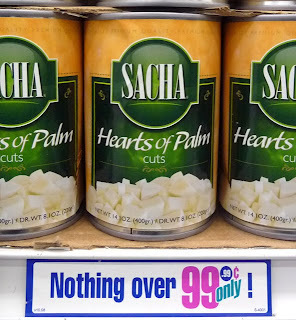 Hearts of palm is showing up at my local 99c only Store. And my recipe is a great use for this South American delicacy. Fresh farmers market summer tomatoes are coming in, and onions and eggs are cheap almost everywhere. 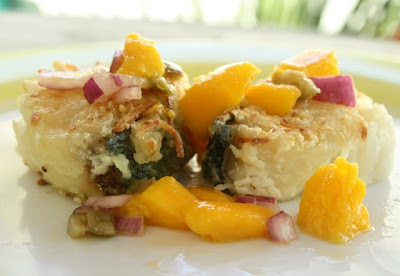 The recipe is adaptable to your favorite salad too, just mix in any other veggies and leafy greens you like. 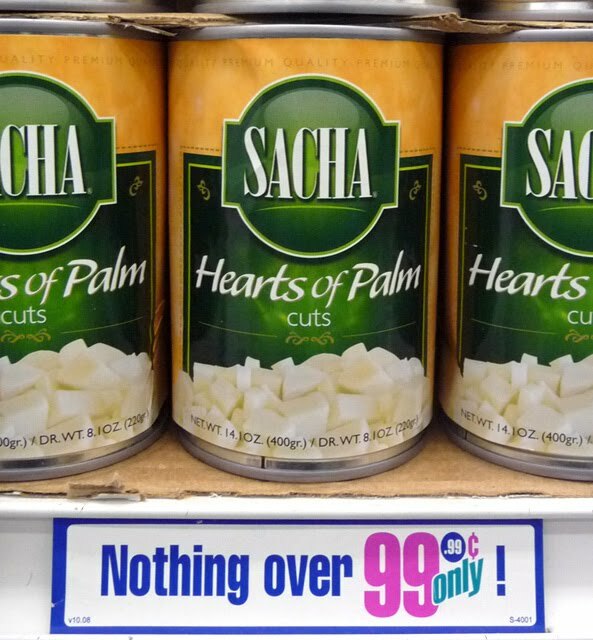 14oz can of Hearts of Palm in water - drained and roughly chopped. 1 large tomato - or 2-4 smaller ones, chopped. 1/4 red onion thinly sliced and chopped - or white or yellow onion. Okay to use as little onion as you prefer. 2 boiled eggs - peeled and sliced or chopped. 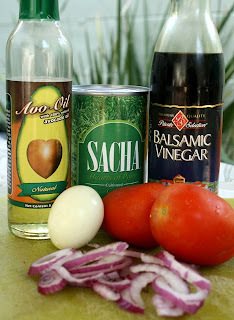 3 tablespoons olive oil - I had avocado oil on hand, so I used it. 1-2 tablespoons of balsamic vinegar - to taste. Combine all chopped veggies in a bowl, or arrange on a large plate. Top with chopped or sliced boiled eggs. Drizzle oil and balsamic vinegar over salad. This salad is adaptable, so mix in any of your favorite salad ingredients. You can even top with a salad dressing you need to use up. If you are dieting, have high cholesterol, or a heart condition, please stop reading my decadent appetizer post! My latest celebratory delicacy is made with bacon AND cheese, so, if you can show me a clean bill of health from your doctor, then read on. My neighbor threw a party a couple of months ago, and served Bacon Wrapped Dates with Cream Cheese. I still cannot get them out of my mind's pantry. Boy, were they good! 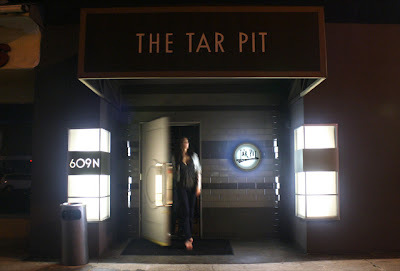 She would put a platter down and the revelers would pounce, and before I could push my way through the throngs for another toothpick-speared sweet, salty, crispy, greasy, creamy nugget, they would be gone. This party appetizer is old school -- portable and perfect with a martini and Sammy Davis Jr. on the stereo. 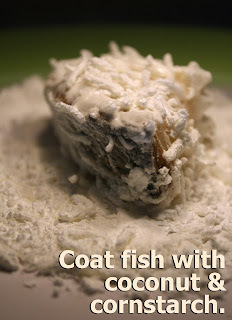 It is labor-intensive, but you can assemble them well beforehand, and keep containered and cool in the fridge. 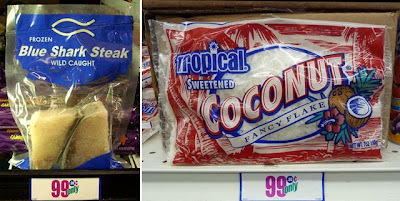 I've found all the necessities at my local 99c only Store. Bacon does not show up often, but when it does I buy 5 packages to freeze. The dates come about 24 to a box, and the cream cheese is an "off" brand, but tastes like name-brand Philadelphia. If you have someone to help you, make an assembly line; it is a little messy inserting the cream cheese into a seedless date. 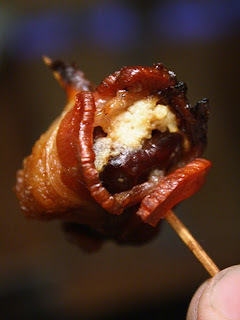 And I used half a slice of bacon per cheese-stuffed date. The dates I bought at the dollar store had seeds, so it took longer to fashion. 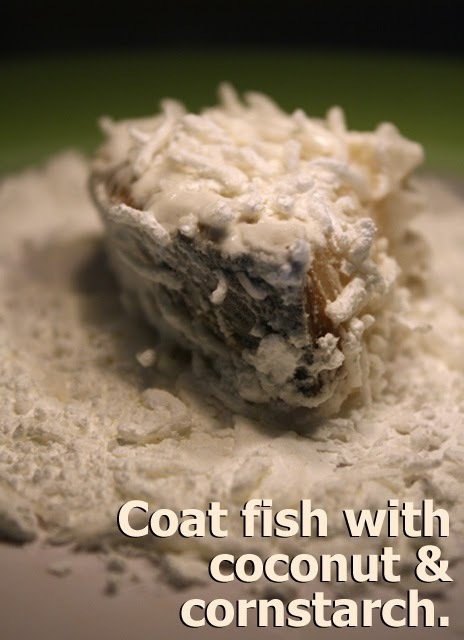 All the ingredients are mushy, oily and sticky, so a light touch is needed. But, believe me, all the effort is worth it! 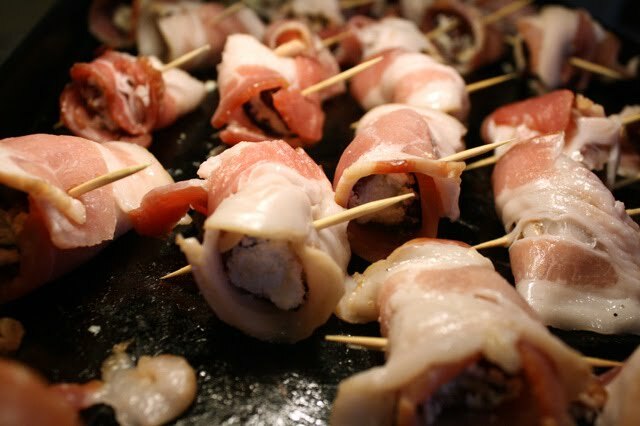 So get the party started -- when you present a platter of these crispy, bacon-wrapped succulent wonders, all the oohs and aahs will be followed with prolonged satisfying sighs! Ingredients - about 3 to 4 (or more!) per person. 24 dates - seedless, or remove the seeds. 12 slices of bacon - 1/2 slice per date. 2 - 4 ounces of cream cheese - may need more or less, depending on size of the date. 24 wood toothpicks or more - some may break in the assembly. Remove seeds from dates if necessary. 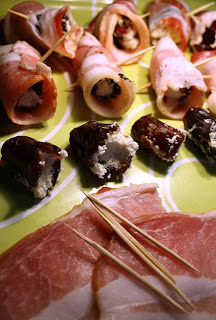 Stuff each date with cream cheese. Wrap 1/2 slice of bacon, overlapping bacon ends, around stuffed date and hold together by spearing through the date with a toothpick. Heat oven to 350 degrees. Arrange stuffed and skewered dates on a cookie sheet or a large pan. If you have a metal rack for the pan, it's even better for keeping extra grease off dates. Bake until bacon is brown and crispy, about 30 minutes. 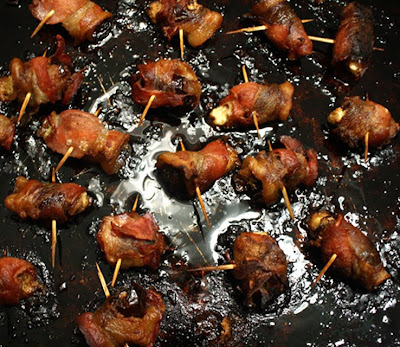 You will need to turn each bacon-wrapped date a couple of times during baking, so it does not blacken where it touches the pan - dates have such a high sugar content, they may burn if left in one position. Drain dates on paper towels for a minute. And serve warm with a cool martini ! Like turn-of-the-century photographer August Sander's "People of the 20th Century" (where he tried to record all of German society - from industrialists to circus performers) I continue to follow my taste buds in shooting my epic 21st Century Los Angeles epicureal photo/video series that's suitable for framing. 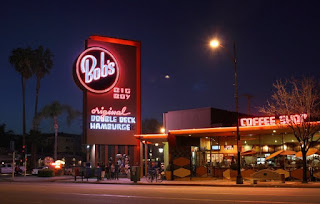 And I film almost everything: from the Valley's Bob's Big Boy Coffee Shop and Eagle Rock's 1955 landmark of Italian cuisine, Casa Bianca, to L.A.'s latest hip speakeasy The Tar Pit (from Mark Peel of Campanile) and everyone's favorite neighborhood Hollywood hang, Birds. I record audio and capture a tasty photo/video segment of 26 local restaurants, at 10 second each, in this five-minute video serial. 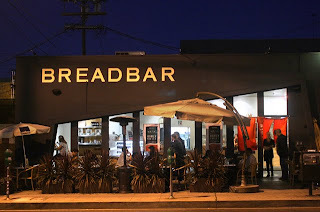 With more than 130 nighttime restaurant photos I've published on Twitter (click here to see the latest ones), I am just scratching L.A.'s Teflon surface of unequaled dining experiences. This time I've shot a savory and intoxicating nocturnal mix of enticing cafes, pungent dives, and exotic ethnic eateries. 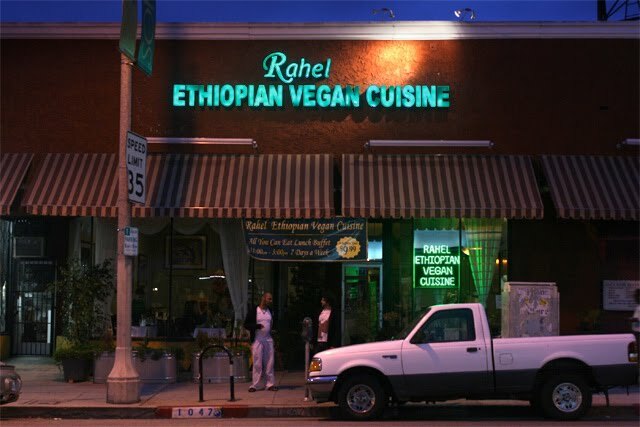 As an example, I walked the short block of Little Ethiopia on Fairfax Avenue in the heart of L.A., and zeroed in on Rahel, the only all-vegetarian Ethiopian restaurant in Los Angeles? Also, of special note, I take you inside the bustling kitchen of downtown L.A.'s cool and elegant Rivera - the kitchen and appetizer bar is separated from the outside by large ceiling-to-floor windows. 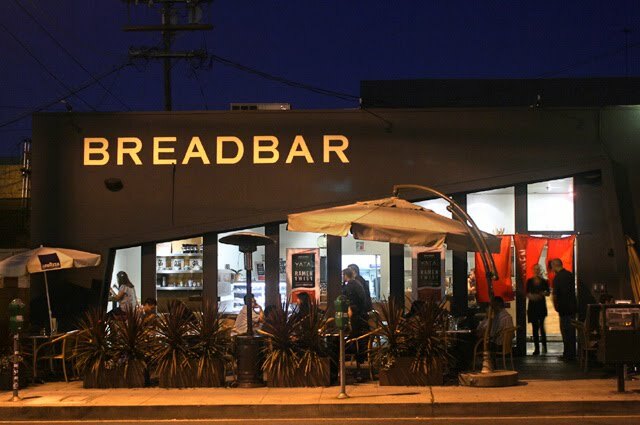 Be sure to check out my clip of Breadbar (a bakery/sandwich shop in West Hollywood), that is spearheading the celebrity chef Pop-up Restaurant theme -- this month featuring a twist on the budget "Japanese Salaryman" bowls of ramen, topped with pork belly and foie gras, from Chef Kazuo Shimamura. 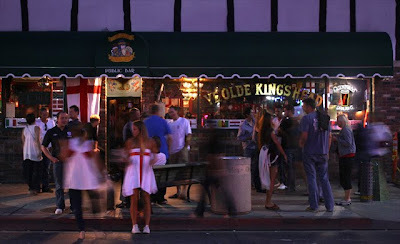 And, I also hit Ye Old Kings Head Pub/Restaurant (one block from the ocean on Santa Monica Boulevard) on the day USA fought England to a tie in the World Cup soccer game -- be sure to check out the rowdy, wild crowd out front! 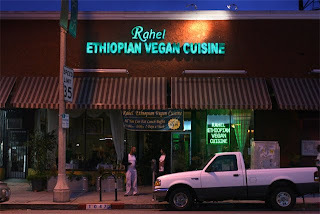 So tag along with a midnight rambler gastronomist through the bustling L.A. restaurant scene and view my latest video "noshturnes." Play it here. The video runs 5 minutes.